Here is the link to the 2006 PALS case studies. There are four respiratory core cases, four core shock cases, and four core cardiac cases. The case studies were on the 2006 PALS dvd. What follows is from that dvd and from additional resources detailed below. 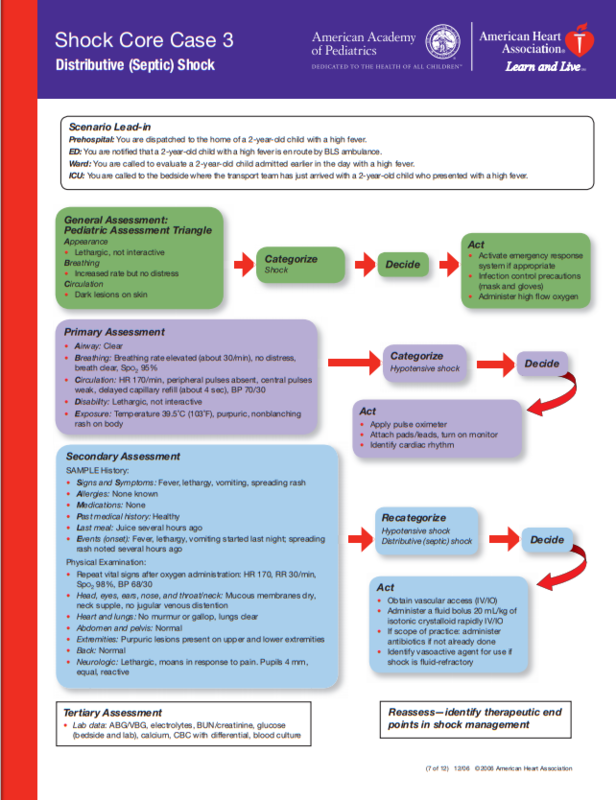 The Pediatric Septic Shock algorithm is on p 221 of the 2016 Pediatric Advanced Life Support Provider Manual. I have included only the initial stabalization part of the algorithm. Altered perfusion (prolonged or “flash” capillary refill; cool or very warm extremities; plethoric [means having a reddish or flushed complexion], mottled color or pallor, possible ecchymosis or purpura; decreased urine output.